The age of the earth and archaic human populations continues to be debated among Young Earth Creationists in their attempts to prove evolution wrong. Evolution stands on four main pillars: mutation, adaptation, natural selection, and common ancestry of apes and humans. Mutation and adaptation are facts. There is evidence for natural selection, but not sufficient evidence to hold this model as a law of biology. The pillar that should be questioned is common ancestry of apes and humans, for which there is no physical evidence. Even evolutionary paleontologists are having doubts about common ancestry. From the perspective of anthropology, the deep time record of human activity is evident in the vast number of objects made and used by humans. Here is a short list. Note the 40 thousand+ custom of burial in red ochre. Butchering flints found in Dikika, Ethiopia. 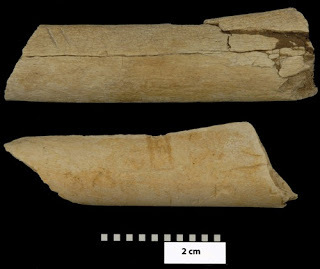 This bone shows evidence of butchering. Evidence of meat consumption 3 million years ago. Stone tools found in Saudi Arabia near the Red Sea from a time when the region was much wetter. A large assemblage of handaxes excavated at Stratum 4a and 4b at the Kathu complex in South Africa. Large mammal remains have been identified at both strata. A trove of hand axes found in central Israel at Jaljulya. Earliest known use of red ochre at site GnJh-03 in the Kapthurin Formation of East Africa, and at Twin Rivers in Zambia. The Rising Star Expedition has recovered remains dating 236,000 to 335,000 years ago. These show the full range of anatomical features found in modern humans. Heat-treated silicrete stone tools at Pinnacle Cave in South Africa. More than 69 000 Stone Age implements have been found at Border Cave in the Lebombo Mountains. Thomas Strasser and his team found hundreds of stone tools on Crete dating to between 100,000 and 130,000 years. Red ochre found in burial of young male in Qafzeh Cave, Lower Galilee. 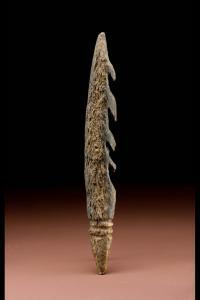 Barbed harpoon points (right) were used to spear catfish in Central Africa. Hundreds of bone harpoons have been found at the lake site of Ishango. 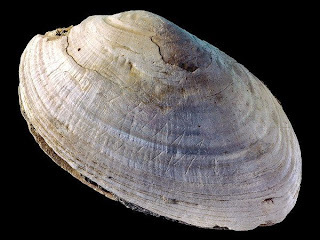 Engraved stone from the Blombos Cave in Southern Africa (below). Four bodies buried in red ochre at Sungir in Russia. A thirty-year-old man buried in Bavaria surrounded by mammoth tusks and submerged in red ochre. Australian burial sites dating to about 20,000 years reveal pink staining of the soil around the skeleton, indicating that red ochre had been sprinkled over the body. The remains of an adult male found at Lake Mungo in southeastern Australia were copiously sprinkled with red ochre. Lady of El Mirón cave in northern Spain was buried in red ochre. She died around the age of 35.